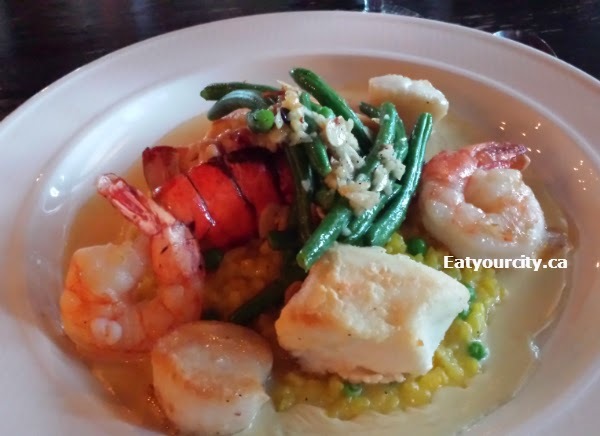 Eat Your City: Oliveto Trattoria Edmonton, AB - tasty Italian seafood specials! 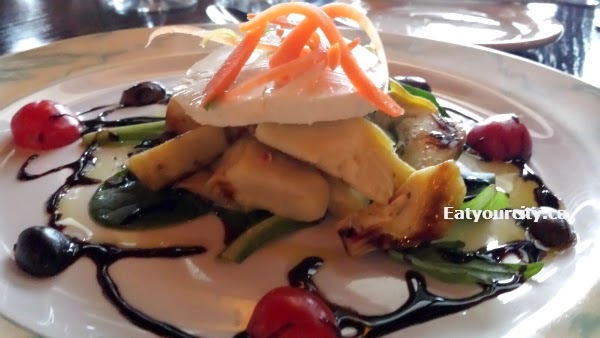 Oliveto Trattoria Edmonton, AB - tasty Italian seafood specials! 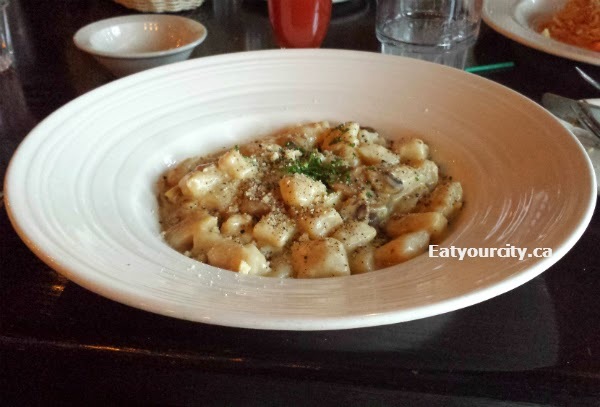 Posted by For my birthday a little while ago, we headed to Oliveto's to enjoy and indulge in some tasty Italian fare. Its not our first time, nor will it be our last.. check out our previous dinner reviews: lobster and friday specials, rack of lamb and lotsa pastas, and first dinner here! Oliveto's usually has a special or two every night with more on fridays and weekends. Specials are typically priced in the $50 range, but are quite tasty! Onto the food! We started out with a round of drinks.. I had some Orangina (think orange pop with some real orange pulp in it) and a tasty Caesar. One of my girlfriend's had a raspberry belinni which was quite pretty, but I forgot to take a picture of it. We noshed on some warm baked bread (not pictured) with some butter too while we chatted and waited for our food to come out. Some of us went with the Crostini with Oliveto's tomato bruschetta. Plenty of garlic laced diced tomatoes and basil atop toasted and garlic oil infused crispy crunchy crostinis. They disappeared like magic. One of my girlfriend's had the Marinated Artichoke Salad. Marinated artichokes are topped with a super creamy mild goat cheese, extra-virgin olive oil and drizzled with balsamic vinegar. Normally neither of us are a fan of goat cheese, but with the balsamic vinegar lending a sweet and tangy finish, it actually masked the "goat-iness" of the goat cheese quite well and was quite an enjoyable salad. The marscapone added in just the right amount of richness to this earthy hearty dish loaded up with mushrooms. My boyfriend went with the Seafood special #1: lobster tails with prawns, broccoli, cherry tomatos in linguine (or was it fettuccine?) in a lobster reduction. The seafood was fresh, with the lobster tails cooked to a moist perfection. The prawns were huge and the lobster reduction lied all the remaining elements together. A few of us went with the Seafood special #2 - lobster tail. prawns, scallops, Artic Char, green beans on bed of lemon saffron risotto. Sadly the lobster tail I had was mushy, but I stole one from my boyfriend's plate and frankly, there was more than enough seafood on my plate that I barely finished half my entree. The rest of the seafood was executed well.. the gently seared scallops was so tender sweet, it practically melted in your mouth. The Artic char was a little over done, but it was the last bit of seafood I got to. The risotto was a bit on the sweet side with a sauce generous in saffron.. but still worked well with the rest of the dish. The toasted pumpkin? seeds in the risotto added in an extra textural element. We finished off with a complimentary tiramisu (not pictured), ordered some more tiramisu, cake, coffee.. and a few of us got some Spiked hot chocolate with hints of mint and came with a side dish of whipped cream if you really felt like indulging. Great little spot for authentic Italian fare and great service. While the specials are on the pricier side, both specials and regular menu have lots of tasty choices!